So many milestones pile up when you’ve been in a relationship for a long time. First date, first kiss, engagement, wedding. When that relationship ends, those dates still come around – and the harder you try “not to remember” the more likely it is that you do. And there’s not just the date itself – there are the cards, the special meals and whatever else you did to celebrate. And now – it’s just another day. Except it’s not. Thirty years ago – today – I kissed a boy. The boy became my husband and we were married for 13 years – at which time he told me that he no longer loved me and wanted to leave. But then he didn’t leave, and I spent the next 8 months watching the walls cave in on my lovely life. One of his favorite desserts was butterscotch pudding. He also loved peach melba but that was his mother’s domain and reserved especially for his birthday. So I got the pudding, which I made many times throughout our marriage. Toward the end – when things were really, really bad – I decided to make him “his” pudding. It was an ordinary weeknight and I thought – this is perfect. This will remind him of why he loves me and why we should stay together and try to work things out. I remember actually feeling hopeful. So I made the pudding. He never came home for dinner and when I woke up in the middle of the night to once again find his side of the bed empty, I went downstairs and dumped the pudding in the trash. I never told him I made it – it would have been too humiliating – and by December he left for good. I have not made the pudding since then – it was too painful to even look at the recipe, to remember. But I today I feel ready to take back the pudding – and share it with you. So if you make it, and love it or – even better – share it with a loved one, let me know. It’s a really good little recipe. Heat 1 ¼ c cream in a small saucepan till warm. Meanwhile, melt butter in a medium saucepan; add brown sugar. Cook, stirring occasionally, till mixture is covered with bubbles, about 5 minutes. Slowly add warm cream and cook over medium-low heat, stirring constantly for 1 minute. Remove from heat. Clean out the saucepan you used for the cream and fill half-way with water – bring to a simmer. Whisk the yolks lightly. Continue whisking and add the milk, followed by the cornstarch and salt, and whisk till blended. Continue whisking and slowly add the butterscotch mixture. Set the bowl over the saucepan of simmering water. Cook for 10 minutes, whisking frequently. Cover the bowl with foil and cook for another 10 minutes, whisking occasionally. Take the bowl off the heat and cool for 5 minutes, whisking occasionally. Pour pudding into (6) 8-oz ramekins. Cover the ramekins with plastic wrap, making sure the wrap touches the surface of the pudding (this will prevent skins from forming – if you like skins you can skip this step). Chill for several hours, till cold. Whip remaining ¾ c. heavy cream (I don’t sweeten the cream, as the pudding is sweet enough). 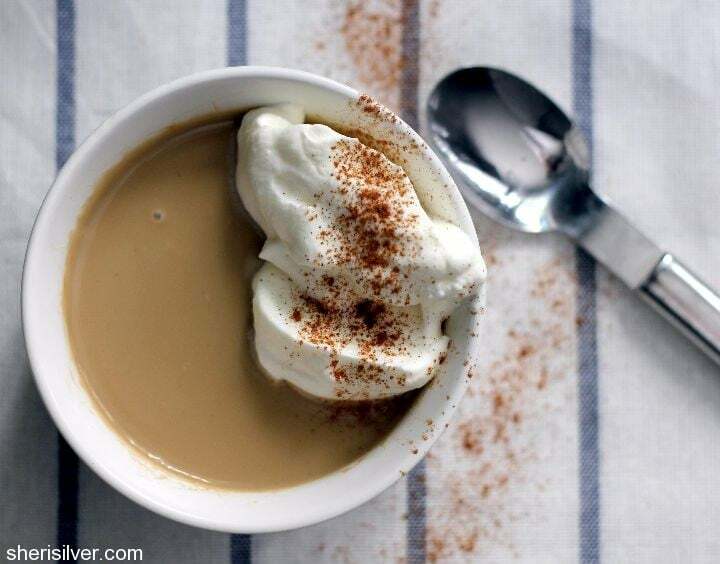 Serve puddings with whipped cream and either cinnamon or ground nutmeg. Puddings keep well for up to 3 days.